Here's my review of Mad Dog McCree that was posted over at Diehard Gamefan. Please check it out. And as usual here's a small excert from it. "There really isn’t much I can say about a game that is almost twenty years old and was ported to just about every major console at the time. Everything from the PC to the Sega CD to the 3DO had a copy of Mad Dog McCree, each with varying levels of quality. 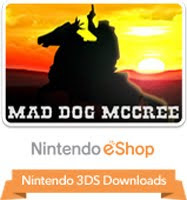 Needless to say, the concept of Mad Dog McCree was a novel idea back in the times when American companies thought full motion video games were the wave of the future. I never got on board along with the rest of the gaming world back in the early 1990’s, and soon game companies fell in line and dropped the idea. For those who read Alex Lucard’s review of the enjoyable Wii port, well you might want to turn away for this one."